The RAF and Commonwealth air crews were bound by regulations and discipline during WWII. Survival was by no means a certainty, with casualties becoming a part of everyday life. The evolution of non-established clubs was recognised and regarded as an important area within RAF history that boosted moral. This book covers the formation of the non-official clubs celebrating the courage and survival of airmen in the midst of disaster. 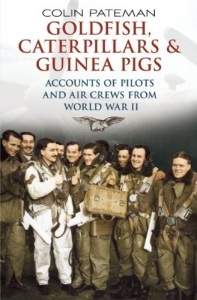 ‘Goldfish’ [lives saved by the use of personal life preservers and dinghies], ‘Caterpillars’ [lives saved by the use of parachutes] and ‘Guinea Pigs’ [lives saved by pioneering surgery conducted by Archibald McIndoe at the Queen Victoria Hospital Sussex] The remarkable feats that pilots and aircrews underwent to become members of these exclusive and prestigious clubs makes fascinating reading. Personal accounts, flying logbooks, medal records and original photographs combine to make a unique and truly inspiring picture of the extraordinary heroism and sense of duty that pervaded the ranks of the RAF during the Second World War. Colin knew many of these men personally and the first-hand accounts they gave provide information beyond ‘hearsay’ evidence. The current ‘Goldfish Club’ membership secretary has endorsed the quality and depth of research of this book, recommending it to their membership.